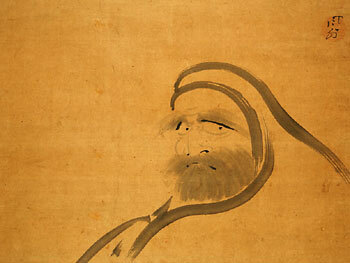 Japanese Zen monk, painter and calligrapher. He entered the Shingon-sect temple Kansoji at the age of four or five, transferring to the Soto-sect Zen temple Chogenji a few years later. Around the age of 16 he moved to the leading Soto temple in eastern Japan, Sorinji. 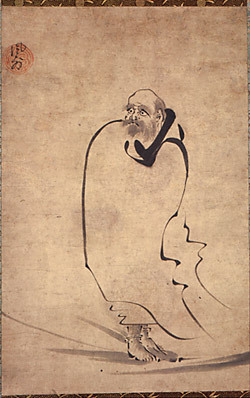 After completing his Zen training, perhaps in 1596, Fūgai spent two decades on pilgrimage. In 1616 he became abbot of Joganji in Sagami Province (now part of Kanagawa Prefect. 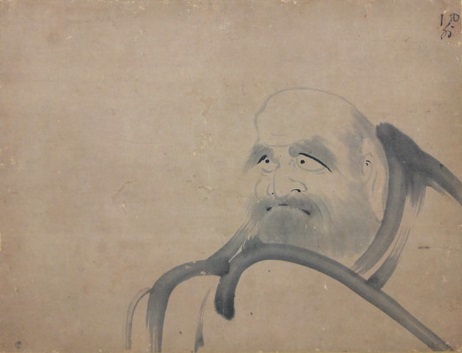 ), but after only a few years he gave up his position to live in mountainside caves, which earned him the nickname 「穴風外」 Ana Fūgai ('Cave Fūgai'). 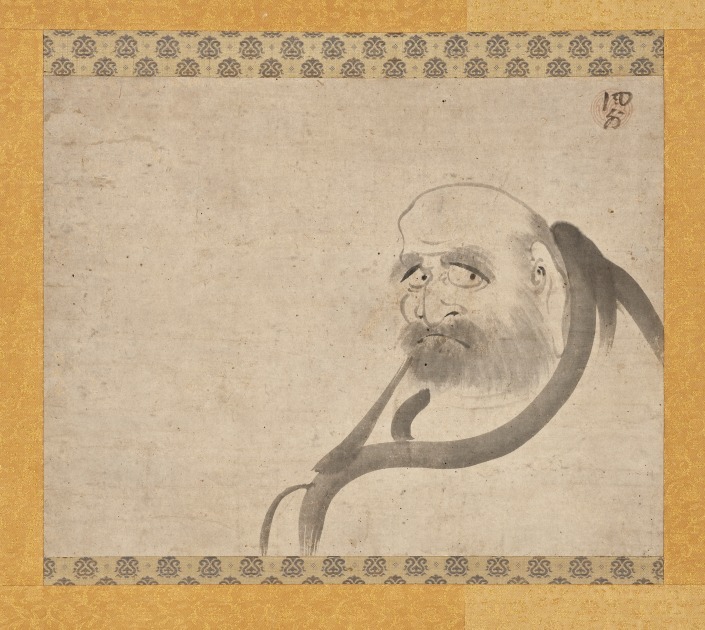 This practice may have been in emulation of Bodhidharma (Jap. 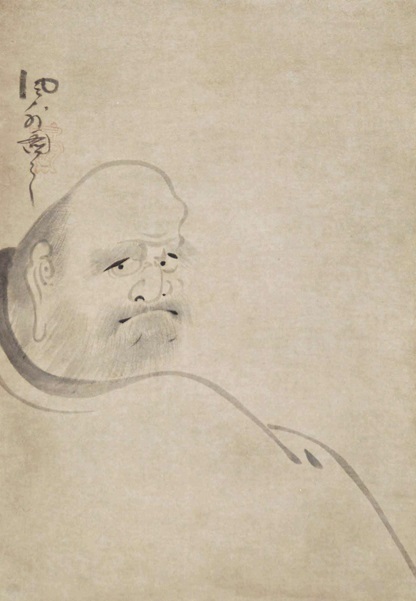 Daruma, the first Zen patriarch), who was reputed to have meditated in front of a wall for nine years; but such rejection of temple life was rare for a 17th-century Japanese monk. 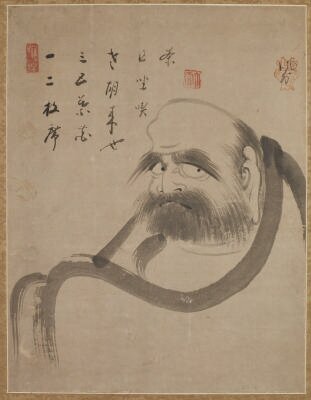 While living in the Kamisoga Mountains, Fūgai is said to have made ink paintings of Daruma, which he would hang at the entrance to his cave, so that farmers could leave rice for the monk and take the paintings home. Many such works remain, darkened by incense, in farmhouses of the region. After some years Fūgai moved to a small hut in the village of Manazuru, south of Odawara, where he continued his ink painting and calligraphy. 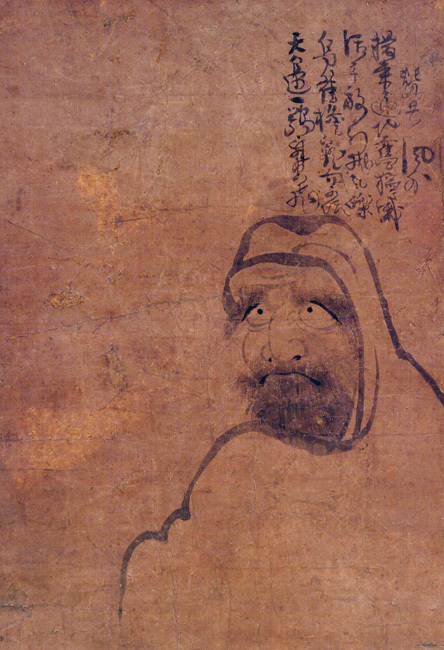 Besides Daruma, he also depicted the wandering monk Hotei (Chin. 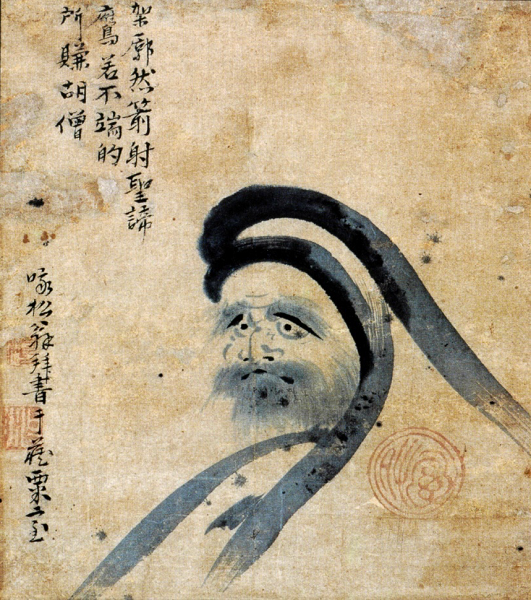 Budai; one of the Seven Gods of Good Fortune) and occasionally brushed self-portraits and landscapes in ink on paper. Fūgai Ekun (1568-1654): "OUTSIDE THE WIND"
New York : H.N. Abrams, 1989. pp. 44-58.
cultural centers, had no pupils, and founded no school. accentuations in black. 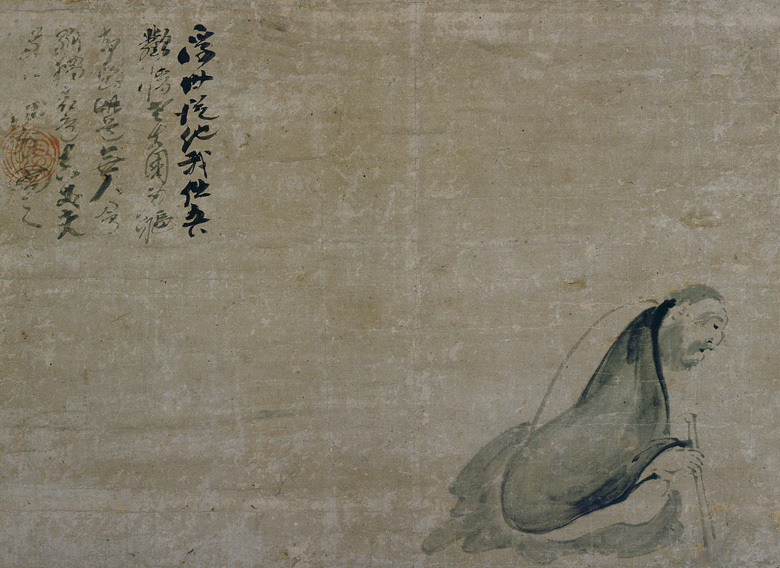 This style of figural depiction, known as "apparition"
as well as by early Japanese monk-painters. of monks) that had long served as Zen portraiture. literally means "Outside the Wind." and was strongly influenced by the works of lke Taiga (1723-1776). The name "Fūgai." 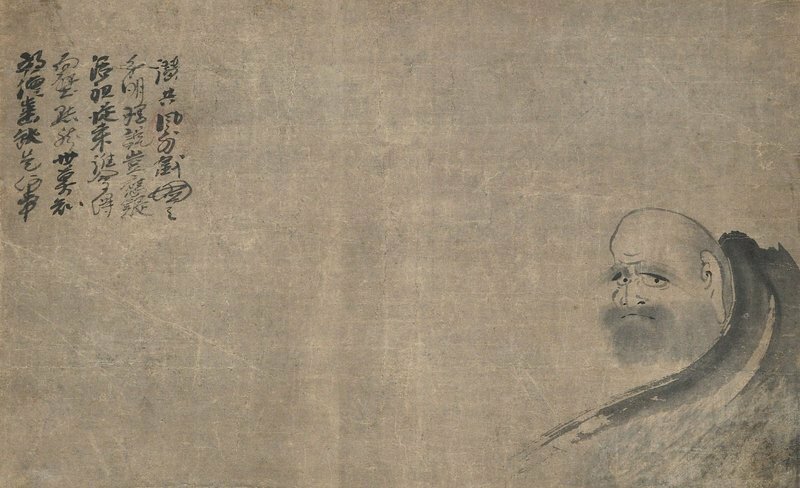 which these three monks shared, signifies an existence beyond the cares of everyday life. Road that connected the new capital of Edo (Tokyo) with the old capital of Kyoto. formally joined the Sōtō Zen priesthood. 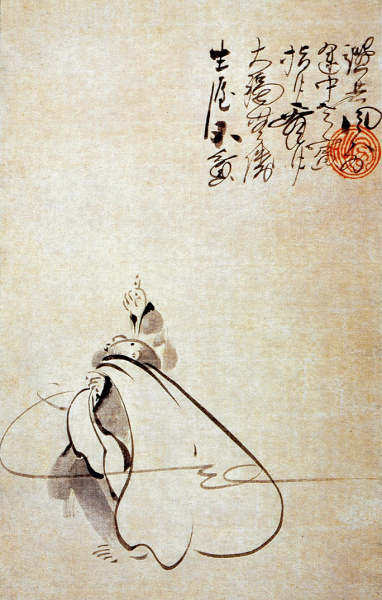 interest in brushwork, since the Sōtō sect had little history of artistry. years he abandoned the temple to live in caves in the nearby mountains. 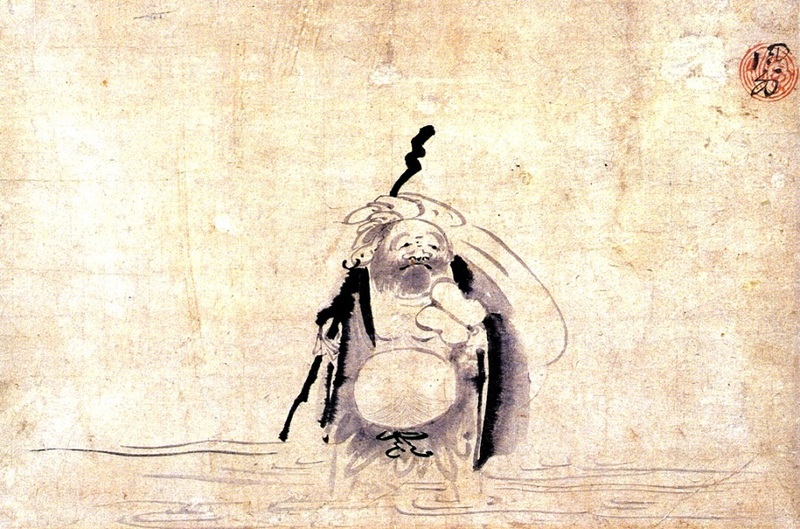 For this reason he is often referred to as 「穴風外」 "Ana Fūgai'' (Cave Fūgai). to administer his small country temple without much outside interference. needed to live completely on his own in order to achieve his Zen goals. poetry, he was ready for greater challenges than temple life offered. he lived in a double-cave that had been a prehistoric burial site. the cave because its opening faces south to a clear view of Mount Fuji. would only delude him, Fūgai wrote that he kept "his windows deeply shut." reached a state of empathy with nature comparable to that of the "immortals"
In loneliness and stillness through the days and nights. The world of men is first and always the world of men. are all Fūgai needed to create a personalized image of remarkable power. 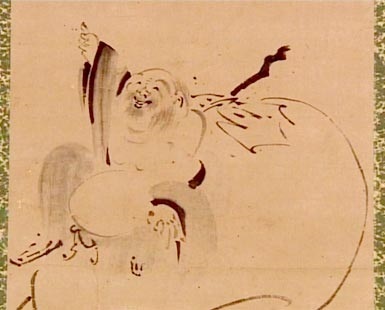 the form of Daruma, while his signature extends down to the lower left. You will be deceived by this barbarian monk. like Daruma, an indication of Fūgai's sense of identification with the patriarch. 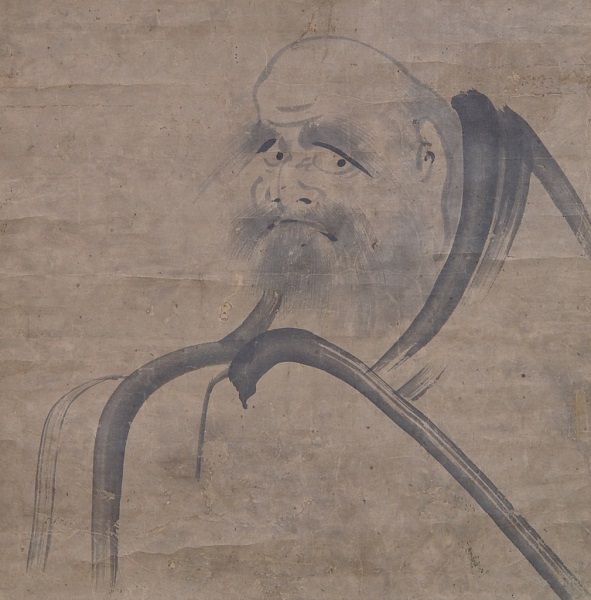 robe seem to encircle his face, emphasizing the sense of his spirituality. The wind entering deep into the grotto mingles with the voice of the stream. A quiet life, off by myself, fulfills my spirit. whether it was meant to portray Fūgai or Daruma; here, the two become one. 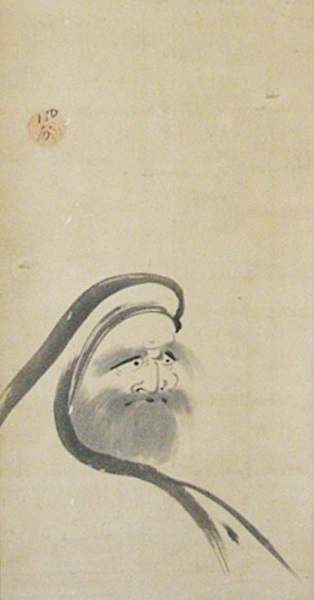 him, at which point Bundō left without another word and never visited again. spirit in keeping with the depth of expression revealed in his self-portrait. as we know, he never returned there. To the monk of Tenshindō. 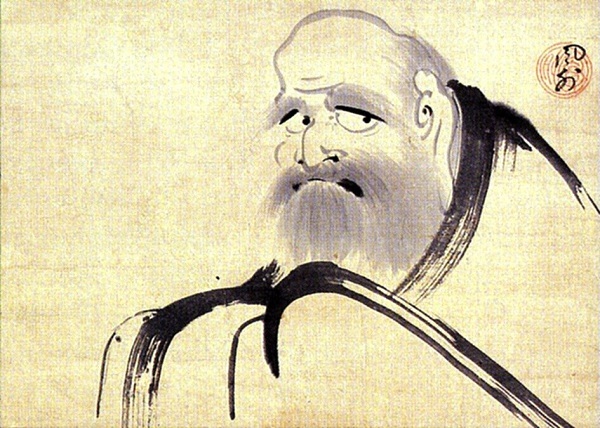 favorite of Zen artists, ranking next to Daruma as a traditional subject. life's treasures, which are actions and appreciations rather than possessions. repeated in the verticals and curves of the inscription. He has riches beyond measure. This old guest follows the way. What moon is white, and wind high? His life is just this chant of meditation. How can he smile so happily? His joy comes from his own nature. Is the only one travelino the road. suggest the paradoxical nature of enlightenment. "flying white," where the paper shows through the rapid, dry brushstrokes. deeply into us and will not let go. Everyone in the Zen tradition is left confused. His living dharma extends to the present day. And frightens every being throughout the land. communicate through his art the intensity needed to reach enlightenment. 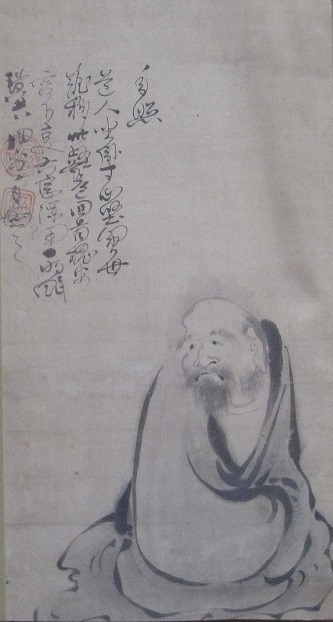 Odawara, Inaba Masanori (1623-1696), and taken to a temple in Edo. attracted visitors. In 1643 one of Japan's most important feudal lords. Mito Yorifusa, visited Manazuru and stopped for lunch at the Gomi home. Fūgai was present at this occasion and wrote a formal account of the visit. learn the strength of the horse; as years pass, we understand the human heart." of rice wine, which was not strained and purified. How to convey their splendor? And laugh at the changes of earthly life. when seen from the perspective of nonattachment. One of the most famous stories about Fūgai, often repeated but unverified. may be easy, but truly living a spiritual life is very difficult. and Tetsugyū ever actually met, their lives were intertwined. There is no place to moor a large boat. His legacy continues to increase and increase. usually small in size and often exist today in a poor state of preservation. reed boat, giving rise to the legend here depicted. 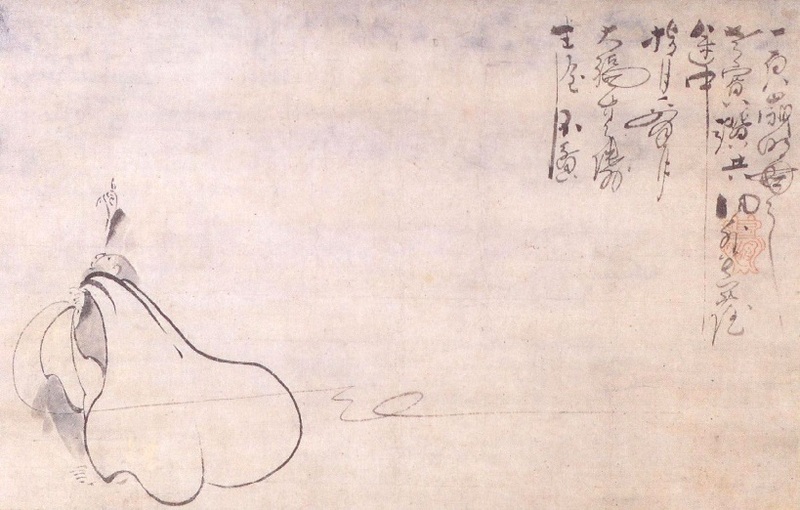 humor that is often seen in the art of Edo-period monks. I merely exist beyond the wind ["fū-gai"]. Expedient teachings, not ultimate truth, are right for you. he walked into the countryside near Ishioka on the shores of Lake Hamana. climbed into the hole and died standing up, at the age of eighty-six. accept Zen students, did not lecture on Zen texts, and had no spiritual heir. become Fūgai's legacy to the world.